Can you tell that it's officially barbecue and grilling season? I am posting yet another review, and there are more on the way. I am a bit backlogged, but that isn't a bad thing. This time out I'll be giving you my thoughts on the new BBQ 25 by Adam Perry Lang, or "APL" as he is often referred to in various online barbecue forums. Late last summer I raved about Adam's book Serious Barbecue, and I will rave about this book as well. This is a very different book, aimed at a somewhat different audience, but with the same great roots. 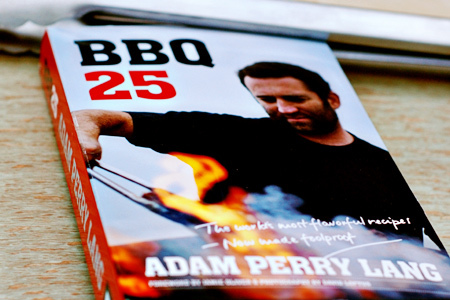 While Serious Barbecue was the ultimate, comprehensive guide to contemporary outdoor cooking, Adam Perry Lang’s BBQ 25 is its ultra-simplified distillation, created for those times when resources are limited, and space and time are of the essence. Here are step-by-step, foolproof recipes for the 25 most commonly grilled meats-from rib eye to pork rib to chicken wings to sausages-presented in an easy-to-use, easy-to-clean, four-color, 64-page board book format. I must say that I completely agree with that description. Put simply, it's a user-friendly distillation of the key recipes from his previous book. 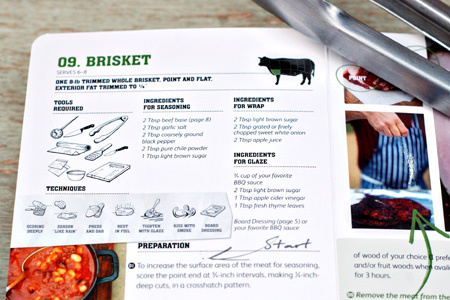 The form and layout of this book are revolutionary for cookbooks. As you can somewhat see in the picture below, it is packed with great need-to-know information that is presented in a way that people think about cooking. It starts with the meat cut and equipment list in graphical form, then moves into the ingredient list, then a graphical depiction of the major process steps, then into the actual process. Again, the format is very refreshing and easy to use. Oh, and it has the same outstanding photography of the previous book, just much smaller. If you are a grill and barbecue cook, you simply cannot go wrong with this book. It's small, very concise, and packed with must-know basics. However, like the previous book, it will stretch your boundaries and bring great new flavors to the table. Get it, read it, and use it! Would be great if you could put a shortcut on the side to all your other cookbook reviews! Or a list of recommended BBQ cookbooks! I bought "Serious BBQ" on your recommendation last year, and still love it. And the recipes work great with my BGE. The only drawback I would say about the previous book, is that it's so thick, that I have trouble keeping it open to the page I want. I know that sounds like an easy fix, but I'm moving around alot while cooking and not worrying about it. Also it makes me feel more experienced with bbq sauce smudges on my pages, so I don't mind so much. Love this guys flavors and techniques. Thanks for the recommendation. Ryan - I know exactly what you mean. This book teaches the same "3D flavor" as Serious Barbecue, but in a very compact (66 pages) and very usable format.